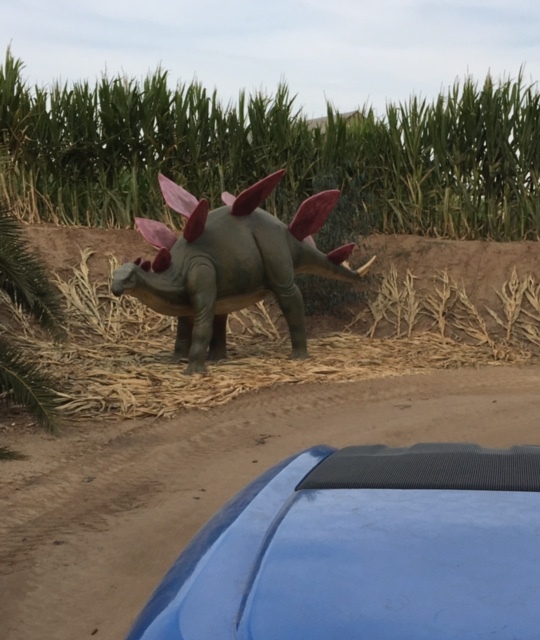 This is one of the first sights you see when you enter the Pumpkin Patch. They have several old wagons hanging around full of pumpkins for that perfect photo op. This place is immaculate! Almonds hulls cover the grounds to control dust and are graded and watered every night. Inside the barn are dozens of bins full of pumpkins, all grown on the property. At the very back (past the tiny chalkboard you see in the middle) are picnic tables for parties. There are also covered areas on both the left and right, full of more tables. Here's my favorite ... the covered wagon ... a real keeper!! By the way, do you think that family of eight knows just how obnoxious and rude they are? They must live in a swamp, because they threw paper on the ground, pushed and shoved their way around and were rude beyond belief to others. Every single one tried to cut the line, so I made them walk all the way to the back. Every one of them also had a Nikon camera, worth at least $300 (I know, because I have one just like theirs). While giving breaks, I ran in to them on the Bounce Pillow. When not busy, we usually leave them on, but this time I kicked them out so three littles could bounce without getting killed. I KNOW these people came from a swamp somewhere. I suppose that's rude, but they were BEYOND belief. It started out slow yesterday, so I concentrated on cleanup and restocking for the afternoon flood of people. Those 180 bags of pay dirt went like lightning, so I managed to fill more bags for the nighttime crowd. In no time, it was noon and the Time Travel Tractor driver needed to leave. That left me with BOTH tractors. Perfect time for a couple of pictures. 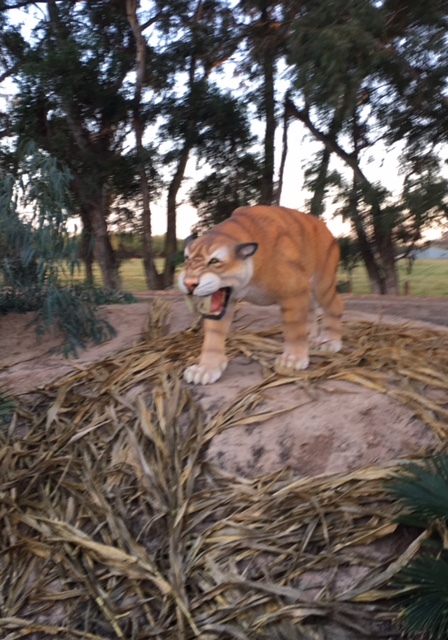 The saber toothed tiger is a favorite of the kids. I SWEAR I'm going to find one of these guys on the internet and have him in my Arizona back yard!! The next thing I know, my trailers are full to the brim on every trip around the corn field. As you can see, it began to get dark. 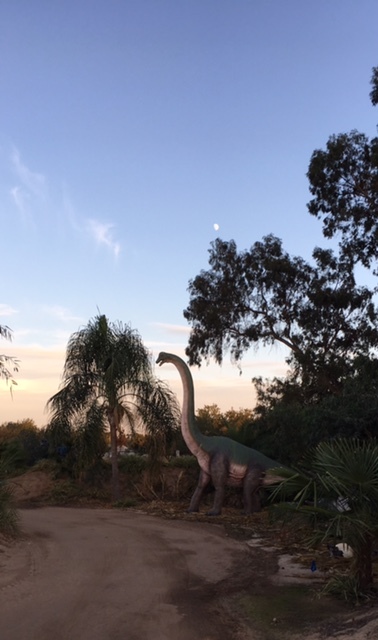 The first trip I spotted the moon over this brontosaurus and tried to get a picture. Kind of hard when you're trying to drive and not drop your phone!! Okay, I lost his head in the bushes, but got the moon!! Unfortunately for me, the ticket girls forgot to quit selling tokens for rides at 6:00, which meant I had to keep driving so people could use them up. I packed everyone right behind me and turned my headlights on so they could see. Cornfields are rather spooky at night! For my trouble ... mostly freezing because the wind came up and it was about 55 degrees with no coat ... I was paid DOUBLE!! Can't beat that with a stick!! So today is the last day of the Pumpkin Patch. I'm going to miss it, that's for sure. I can't begin to tell you how my stamina has improved, I'm feeling much stronger from all the walking and climbing on and off the tractor. To top it off, I lost 8 pounds, although I gained two back from the hot dogs. I should be home by noon to set up my Halloween Trick or Treat Porch. Pictures to come!! Even more surprises! I think if people were as creative at working and making a living as they are at trying to cheat Hunter Farms Pumpkin Patch out of the entry fee, they would be millionaires. By the time they get to this point in the entry, they have passed three signs that say it's $5 to enter. It matters not ... they STILL try to walk right past the pay booth. When the cue gets full to the brim, I sell wristbands and tokens for cash to move things along. As I was waiting on a nice couple with three kids, another family of five tried to sneak by. CAUGHT!! I'm sorry, do you have wristbands or tokens? "We're trying to decide what we want". Please move back to the cue (where you can actually SEE the price board). "WHY? We're not even through the gate!" I'm sorry, but you are way past the gate, the cue and WAY past the point of paying. You need to move back please. They always become incensed when they get caught!! On weekends, lunch is free. YUM ... semi warm hot dogs. It's okay though, because I'm a big fan of hot dogs. On my way back from lunch, I stopped in at the Gem Mining attraction so I could show you what I've been doing for the last two days. I fill plastic bags with "gems" and Indian arrow heads, all weighed on a scale, then head to the sluice box. Every day they shovel out the sand into a large wooden box, where we use it to fill these bags. Dump the gems on the sand, and with three quick scoops of my plastic cup, they are full and ready to roll. To make the experience last a little longer, I try to get people to dump in one third of their bag in the screen box. Once dipped in the running water, the magic gems appear to the screams and delight of the kids. The more you ooh and aah, the more they giggle. It's fun, to say the least. The rest of the day went really well, since clouds came over and cooled us off to a lovely 75 degrees. That didn't keep some people from trying to play the switch game however. After wearing a wristband for at least three hours (they think I won't remember them), a lady wanted me to exchange it for $5 tokens. She said her daughter didn't get to ride anything. Oh no I said ... with that wrist band she can ride EVERYTHING (which I'm sure she already had). I can't change it once she has it on her wrist. So she rode all the rides and now wanted $10 to spend on food ... sorry, but I'm not sorry. Today will be a slow one. I think I'm going to wear my tractor driver hat. Our nice Serbian tractor driver gentleman has not shown up for two days now, so I imagine that will be my job. It's my favorite one!! The last day is a pumpkin free for all. You cram all the pumpkins you possibly can into one of the wagons, which is then rolled across a board with sticks nailed on top. Whatever doesn't fall off, you get for $20. Much as I would like to have the pumpkins, I think today will be my last day to work. I really need to get to work on my Halloween porch for trick or treating. 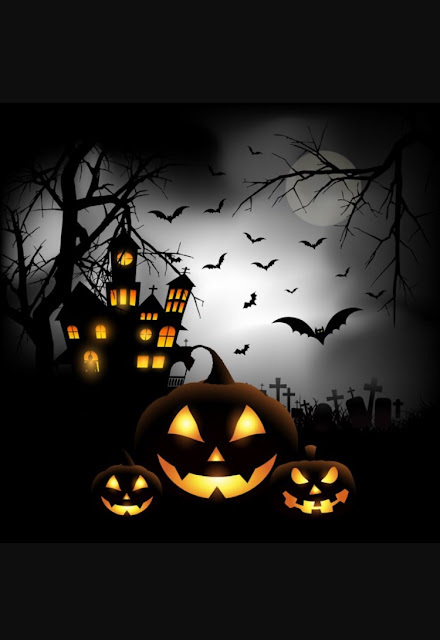 Do you have your stash of candy ready??? It started off quietly yesterday. Although there were people waiting in line at 10:00 when they open, they pretty much came in waves. The cue would be full to the brim, then empty for a time. Previously, anyone who came to the Patch was allowed FREE entry. Only the kids who wanted to ride the rides had to pay. The "rides" consist of the Time Travel Tractor, The Hay Ride, The Corn Maze and the Bounce Pillow. The Hay Maze and Dino Dig are free. Naturally, people being people, they all wanted EVERYTHING for free. They began to steal pumpkins and tear things up. To keep the hoards a little under control, this year a new policy was instituted and the CUE was built. You pay $5 to enter and you either get $5 worth of food or $5 off your pumpkin. Of course some people didn't like that idea at ALL. Occasionally they just say Oh Hell No and walk out. The good news is there has been no stolen pumpkins (that they know of) and no trying to steal the dinosaurs. Yes ... they literally tried to load up a dinosaur. Even with that, you just can't imagine how many people I caught trying to sneak in yesterday. I was the gate guard. Two couples hid their children under the counter so the girl couldn't see them and didn't charge them. One lady tried to bring in her "companion" dog, with no paperwork, just a cute felt vest she had sewn. Many just tried to walk right by the pay booth AND me, to no avail. I'm a great white shark when it comes to things like that!! The family who each held an $8 Starbucks drink in their hand refused to pay ... too expensive they said. The gangbangers with prison tattoos seemed to have lots of money. We get them all here. Occasionally, I'll throw in a few dollars myself. There was a very nice looking religious family (I won't name names) who I really think could not afford it. The children were totally disappointed. They paid for the kids, I paid for the parents. I also doled out some tokens for parents to ride the Time Travel Tractor with their kids. I always tell them to pass it on when they can. A little kindness goes a long way. My view for most of the day. Gate guarding is not hard, but it CAN be hot. It was 87 degrees at the Patch yesterday. I think someone made a mistake and it's really still August. Good grief Charlie Brown, it's practically NOVEMBER and it's 87 degrees!! The men felt sorry for me standing in the sun, although I was pretty creative about curling myself around the price sign to stay in the shade. Even a listing umbrella helped ... A LOT!!! At 5:00 I finally left with my dogs screaming. I guess during the week when I'm sitting down driving the tractor, it's giving my feet more relief than I imagined. I just keep thinking of the prize ... this will pay for all my diesel fuel next year. TWO AND A HALF DAYS TO GO .... we close early on Tuesday. Everyone at the Patch is counting down the minutes. Those who work the long day shifts are tired and ready to call it quits! Unfortunately, Sadie Hawkins Day beats out Halloween when it comes to the teenage set. Half the crew has either taken the day off, or for those that didn't get the day off, called in sick. When you have 3-400 people coming to the Patch, it means Nancy has to work the final weekend. It's okay ... I like to help. Here's a sample of yesterday's activities. This is the Dino Dig. 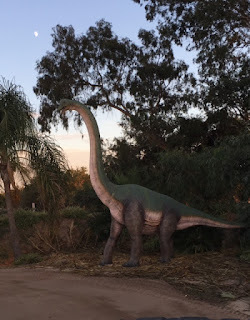 Covered with sand every night, there are dinosaur bones to be discovered. There are ten kids there, along with 25 adults ... a typical school group. My last seed planting was for a group of daycare kids. That's right, 2-3 year olds, planting seeds in a cup of dirt. You can imagine how well that went over, but who cares, it was my last class. Or so I thought. Out of the blue came 40 third graders who added on at the last second. I was short of dirt, but made it work. DONE!!! I turned in my seeds and markers for the year!! Since gem mining is a weekend favorite, I filled 187 bags with "gems", then took on the daunting task of filling the bags to the top with the required "dirt" (course sand actually). It's kind of a fun job if you're in the shade during the 90 degree heat of the day. I was on my knees to ease the back stress when our tractor driver from Serbia came over and grabbed my hand. Not sure what was going on, I must have looked at him rather funny. "In my country, women do NOT get on their knees for any reason. I will do this for you." Wow ... a knight in a bright orange T-shirt!! Okay then!! I showed him the easy way of dumping out the gems, than using my cast off plastic cup to fill them in three quick scoops, which also distributes the gems. I drove the tractor, he scooped the gems. What a deal!! Today I'm the Gate Guard. You just can't imagine how many people try to sneak in. I personally have caught eight ... others probably more. With it being a big day, the entry line extends clear to the parking lot, so my job will be to sell wristbands $5 or $10 for cash only and let them through the back gate. They were hesitant at first .... seems Sean is a 6' tall 250 pound guy and has kept the masses at bay so far. Oh believe me folks, no one will get by MY gate!! Cranky old women can carry just as much weight as the men!! I got a big surprise at the end of the day yesterday .... one of the best cheeseburgers I've ever had. Scott and Michelle are great people to work for and are overworked more than you can imagine. I try to tend to things I can to give them more free time .... like giving everyone their breaks without being told to do so and making up those gem bags without being asked. It's just what I do. As a thank you, Michelle brought me dinner. You can't imagine how much that little cheeseburger meant to someone who has been eating tuna and noodles for the last week!! It was AMAZING!! So I'm off for another day!! Four days and counting DOWN!! 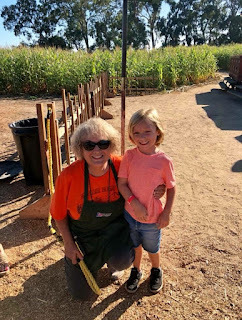 My little buddy Braden came to see me yesterday at the Pumpkin Patch. He's probably the closest I have to a grandson. His grandmother and I worked together at the County Auditor Controllers Office for 13 years before I retired. Then his mom lived with me for a few years while she got rid of a no-account husband. Those were the best years ever, because I could take off anywhere, any time, and I had a built in housekeeper/dog sitter. At any rate, he's my little tractor driver. He LOVED sitting in the motorhome pretending to drive, and when he found out I was driving tractor at the Patch, he just had to come see me. Don't I just love it!! I took them on the Time Travel Tractor through dinosaur land where the look on his face was priceless. It was a full load, so all the little kids were screaming. That makes the whole thing worth it .... even the being sick part. I took a quick ten minute break from the Hay Ride Tractor ... yeah, I was driving both while giving lunch breaks ... and we went to feed the goats. Most little kids just LOVE this. Braden ..... not so much. He didn't want to put his hand down there AT ALL!! As you can see, it attracts lots of kiddos. He did finally get up the nerve to pet them on the head while I fed them. He probably had that all figured out ... they slimed ME instead of HIM!! There are lots of crazy stories from the Pumpkin Patch ... here's one from yesterday. As I pulled back in with the hay wagon, some gal in four inch heels, skin tight pants and LOW cut top, was trying to drag one of our wagons out of the road, having come from the Corn Maze. As I came to a stop, I noticed her wagon was full of corn. WHAT???? Wait!!! You aren't supposed to pick the corn from the corn maze I said, mostly directed to the two little girls. "Well we're going to eat it"!!! She had the most perfect dozen ears of corn. Honey, that's not EATING corn ... that's not for humans, it's for the corn maze and you feed it to cows. You're not supposed to pick the corn. As Mom remained completely silent .... "oh, well we were going to feed the cows" (mom has taught her well). I'm sorry hon, but you'd have to chop it up into really tiny pieces for the cows to eat it. So please don't pick any more corn. No corn picking in the corn maze. Ten minutes later when the driver returned to the tractor, here's the wagon sitting right in front in the middle of the road, with all the corn still there. Good grief!! I drug the wagon away and disposed of the corn. Really? Who goes into a corn maze and picks the corn??? It's an easy day today ... only 20 seed planters to entertain. Not a bad day ... not bad at all. I set up for my 90 seed planting kids, then helped shuttle over 300 into the Pumpkin Patch. That's a drop in the bucket considering there was another 300 coming around 2:00. The first 60 of 90 went well. It was the last 30 kids who were being very cooperative, when three more classes came in and surrounded the critter corral, screaming at the top of their lungs. Needless to say, that put a quick stop to the attention of my class. Remember that whistle?? I blew it loud enough to wake the dead. Suddenly the barn became VERY quiet and I went on with my class. I'm beginning to like this whistle thing A LOT!! Once done, I gave lunch breaks, driving the Time Travel Tractor around the well worn path. Still feel really good, I filled some pay dirt bags for the Gem Mining attraction. It's simple. Dump out the gems on to a pile of sand, then grab a cup full of gems AND sand and dump it back in the bag ... four times did it. For some reason, the "boys" would rather talk than fill bags. Such a coincidence .... I had to leave at the 2:00 arrival time of the next big group, to await my plumber. Excellent Plumbing is a local company, owned by a couple who do all the work themselves. They came highly recommended when I put out a NEED HELP message on Facebook. He climbed up to the 16 foot high ceiling before entering my attic. "Turn the water on ..... turn the water off". That was the conversation for the first hour. He could find nothing wrong. It wasn't the breaker, I checked them all. He went through the regime set up by the manufacturer, Takagi (an excellent brand he said) and nothing happened. The green light was on and it SHOULD have worked, but it did not. He took things apart, checked the filter, which was extremely clean for it's 10 years of use, and found nothing amiss. He will call the manufacturer for suggestions today. Unfortunately, I won't be home long enough for a repair until November. Another week of doing dishes in the bathroom sink. That's why I REALLY like paper plates. It probably costs me the same as if I used real dishes and the dishwasher. You see, I'm allergic to doing dishes. No really ... I'm allergic to the soap. It was so nice when I was a kid, to have my hands break out and blister every time I got in soapy water because I was relieved of duty every time!! I do NOT however, want this to go on for very long. I need my dishwasher and some hot water for washing clothes. Today is another day with 500 kids hitting the Patch. By now we are a well oiled machine when it comes to getting them in and out. Okay, not really. We just fake it most of the time, but so far no one has figured that out!! The morning at the Pumpkin Patch, only three hours long, seemed like twelve. It wasn't that I felt bad ... it had a lot to do with the 300 rowdy, unruly, mindless little creatures that roamed the Patch looking for blood. Good grief parents ...... teach your kids how to act in public!! I have to admit that many of the teachers have less control than the parents, which is zero! Maybe the teachers are just afraid to make them mind when the parents are around. I on the other hand, am NOT ... and I HAVE A WHISTLE!!!! The best class I've had for seed planting had nine kids, all four years old. They were quiet, respectful, did exactly what I requested and even asked questions. They all got gold stars!!! They also got to feed the goats, which none had ever done before, because they were so good. 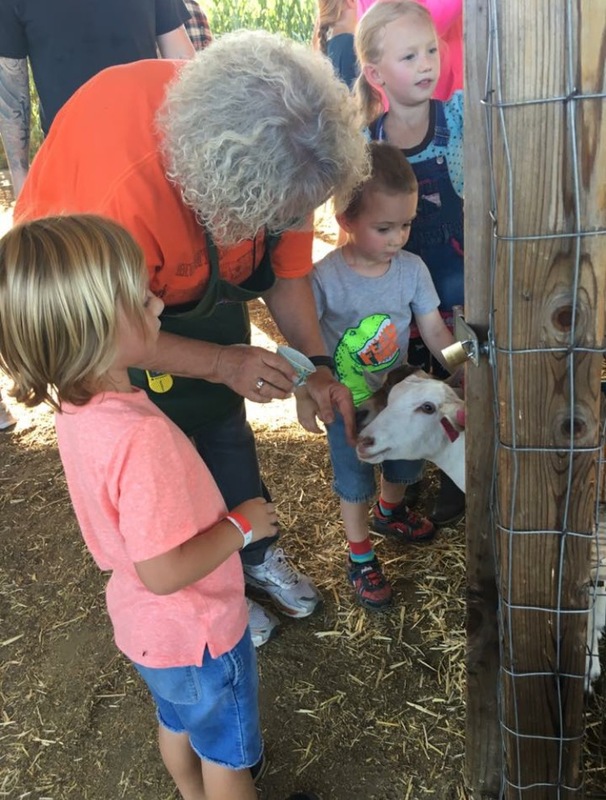 There's nothing better than seeing their faces when soft goat muzzles cross their hands. Once done, I grabbed a wagon and filled it with pumpkins for the porch. They didn't go far ... I guess I have a big porch!! 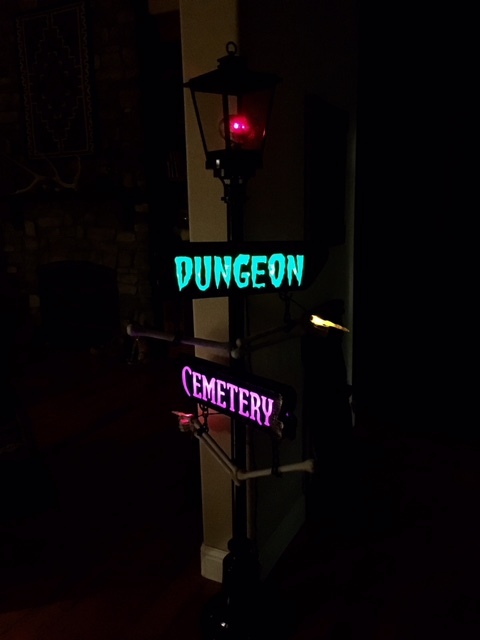 Little by little, I'll add things until Halloween, when I'll pull out all the stops. No use putting things out just so the local hooligans can steal them. Luckily I still had enough strength left to hit Costco for some candy. Yup ... I give away the good stuff. To be completely honest, it's not because I'm so generous ... it's because in case I have leftovers, it will be something "I" really like ... like Snickers bars. I'm gathering all my strength for 90 seed planters this morning. I've cut the spiel down to bare minimum in an effort to get them the heck out of there ... I mean to get them on to the Patch attractions. In the meantime, I have one small problem at home. NO HOT WATER!! There are two instant water things, or whatever they are called, in my attic. It's hard to find a plumber with a really tall ladder to gain access through the 16 foot high ceilings. No one told me they required maintenance, but I suppose I should have known. The kitchen, dishwasher, guest bath and laundry room only have cold water. Thank the Lord MY bathroom (ergo my shower) still has hot water. I'll let you know how that goes. When I sit home alone too long, my brain starts working faster than my body can keep up. Every year, Halloween is my favorite holiday to decorate for. In fact, it's usually done at LEAST by the 15th. Between the Pumpkin Patch and being sick, I've been falling behind. While on the couch half asleep on Sunday, I remembered my Mad Hatter hat I purchased at Disneyland probably ten or twelve years ago. I never had a chance to use it. In a few short seconds I had my outfit laid out in my mind. Hat, jacket, boots ..... I even went so far as to hit the third drawer in the bathroom where all the weird makeup resides. Amazingly, the clown white is still in good shape. This may work out after all!! Or not!! After some unacceptable side effects from the Amox-Clav meds, I made a call to the Doctor's Office for a replacement. You know how they are ... it took some talking ... but I came home yesterday with some new meds. It's the Z-pak I asked for in the first place. Now feeling rather punky and puny, I'm not sure the costume will make an appearance. I'm actually going to work at the Patch this morning for two quick seed classes. I'm hoping to get paid in pumpkins for the porch. Now if I can just get that outside outlet to work so the butler can talk to the kids when they walk up, I'll be WAY ahead of the game. The new woman my Doctor promised has not materialized. Every time I look in the mirror, I see the same old one staring back at me!! Well enough to be bored, I finally decided on a trip to the grocery store. Jonathan was completely out of fresh fare, which he requires every day. With my coughing now to a minimum, I felt pretty good about finding new vittles. Back home with the fixins' for some comfort tuna and noodles (and TV dinners for a week), I began to plan for the homecoming of my housemate. He comes out from his storage bin every Halloween to scare little kids on the front porch. Trust me, he scares the big kids too. It's amazing how realistic his skin and face look. I stood him up, tried to straighten his suit, then walked out of the kitchen. When I returned a short five seconds later, he scared me to death. THERE'S SOMEONE IN THE KITCHEN!! I was half way to the bedroom for my weapon of choice with adrenalin pumping before it dawned on me. Nancy, you're such a dummy!! I knew this was going to happen again and again until his night watch duty. I tried covering him up with a sheet, but it didn't help. Finally, I drug him into my spare bathroom and shut the door ... or at least I THOUGHT I did. This morning as I turned around with two bowls full of dog food, I got the same scare again. Well you little RAT!!! It's going to be a L O N G week!! I think I'll wander over to the Pumpkin Patch this afternoon for some pumpkins. If I'm going to decorate my front porch, they are a MUST. At long last, I'm feeling MUCH better!! I'm finally feeling like I just might survive this nasty stuff. It sure seems like the older I get, the harder this stuff is to get rid of. Don't know if that's due to age or if the bugs are getting stronger. Lucky for me, this time I didn't get the horrendous sore throat that usually accompanies the crud. 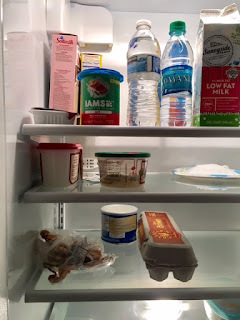 With my sad fridge looking pretty bare, I definitely need to hit the store today. It will be a good test to see just how far I've come. I turned those chicken breasts into chicken tenders, although they were tough as nails. Should have pounded them out first, a thought that never entered my crud-filled brain. There's one egg left in the carton, but that's for Jonathan. Cooper, sweet boy, spent the entire day with me on the couch, as did Miss Jessie. I think I watched every single episode of Yukon Vet. I WOULD have watched the Yankees lose, but Direct TV saw fit to exclude it from my viewing area. Here's a snapshot of my Seed Planting Classroom. Just imagine 75 kids crowded around those six wooden tables. That was due to a schedule mixup. It's hard enough to keep the kids in line ... the teachers are even worse. I was escorting 150 from the buses to the Time Travel Tractor ... how hard is that to stay in a straight line ... when I discovered 100 were missing. I backtracked, to find the teacher taking pictures by the water wheel, in the complete opposite direction of our required travel. They were worse than a herd of cattle to corral. Pay ATTENTION people!!! Most even have maps and time schedules and STILL don't know where to go. Once I hit the store, I'll be back on the couch. I would probably try to squeeze by, but Jonathan's supply of fresh veggies has run out completely. I can breathe really well now and am hardly coughing at all. It's all down to how strong do I feel. Since I was able to vacuum the house after three weeks (good grief ... where does all that dirt come from???? ), I'm thinking I'm on the mend. YAY FOR ME!!!!! A Pin Point Of Light!! Sleeping when you've got the creeping crud is an endeavor in futility. Go to bed ... get some rest ... yet when you lay down, the explosion in your head and wracking cough in your chest bring you right back to upright. I keep this sign plugged in just in case the end is imminent, I'll know where the cemetery is!! Finding something to eat has become an interesting proposition too. I haven't been to get groceries in two weeks. I'm down to just a few choices now .... canned chili, pumpkin bread and three frozen chicken breasts. With my head so full of gunk, it's hard to contemplate how to combine these three into something edible!! 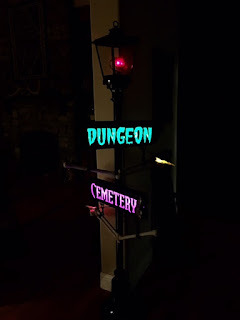 In an act of sheer boredom, I plugged in my latest scary front porch feature, the flying ghosts. At least it kept Cooper distracted from the ball for fifteen minutes. Speaking of which ... as I sat in my sewing chair with my head on the table, just to have a different view for a change, Cooper found a raggedy ball to play with. This is his latest and greatest game. Guess where the ball is!! He dropped it in the corner of my scrap box. 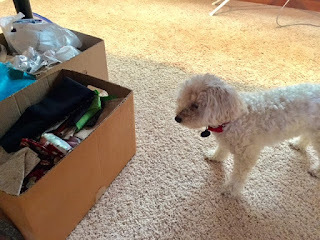 I dig it out and toss it across the room, he deposits it back in the box and waits. Why do I get the weird animals??? The good news is I actually did get a few hours sleep last night in spite of the bombs bursting in the air all around us. I've no idea what that was about ... something akin to M-80's going off several blocks away. You might be a redneck if you're firing off this stuff three months after the fourth of July. Or maybe it was the local SWAT team. Who knows!! This morning I can actually take a deep breath without coughing. Not several in a row, but at least one is a start towards the pin point of light at the end of the tunnel. In spite of my need for food, I'm determined not to go anywhere but the couch for the entire day. I think I spotted a package of Ritz Crackers in the freezer which should hold me over until tomorrow. I will be ......... as previously .......... on the couch!! Like a broken record going over and over again ... I'm still sick. Every morning I wake up just as sick as the day before. Apparently the pills aren't of the same miracle quality as the Doctor's visit. I can't breathe through my nose, my head feels permanently plugged up and I'm waking up the dead with my coughing. For even more fun and enjoyment, a huge thunderstorm came through keeping me up half the night. That's not even counting the upset stomach I got from the combination of horse pills and cough medicine. I'll be on the couch ......... again!! Nothing Short Of A Miracle!! Okay, I've had about enough of this sick stuff. My voice finally gave out in class two of four yesterday. That's when you meet the most wonderful people in the world. Stephanie, our office gal, had her husband go to Walmart and get some cough syrup for me. I've always been a do-it-yourself gal, so when someone does something that nice, it melts my heart. Teachers are another lot in the same group. Not ALL teachers mind you, since I've seen some questionable examples in the last two weeks along with those 3,000 kids (and only 3,000 to go ... whoopee!!). There was one yesterday who was amazing. She kept her class interested, listening, involved and thrilled to plant two seeds in a cup. I'm here to tell you, that's talent and nothing short of a miracle!! That same teacher gave me two cough drops ... says she needs them all the time ... and I was able to finish the last class before dragging my sick bottom to the car and driving home. I laid on the couch for two hours. That's when the SECOND miracle happened!! I called "Uncle" and at 2:45 called the Doctor. They had a 3:00 appointment. Once I finally got past the new check-in procedure with an orange computer ... hard to do when you can't concentrate on anything ... I was ushered in to a room. Wow ... that was fast! At 3:05 the Doctor came in. Wait ... am I in the wrong office ... is this the accounting firm??? Twenty minutes later I was out the door with a prescription electronically called in to CVS Target. After my last $175 Walgreens disaster, I decided to change pharmacies. I expected at least an hours wait while they transferred everything over. It was an absolute miracle!! I walked in the door, gave the kid my name and he stated my prescription was ready. Couldn't be I thought ... it's only been maybe 10 minutes. Sure enough, my $38 prescription was handed to me and I was out the door. I was in total shock!! In an amazing 65 minutes, I saw a doctor, had a prescription and was back home. Can you believe it???? The planets must be aligned perfectly and someone was looking down on me with favor. So ... sinusitis and bronchitis ... rampant in all the schools ... if I take these horse pills, I'll feel like a new women in 48 hours. Only 36 to go and I feel better already. Although I'm tempted to go to "work" today, my voice has not yet returned. I'll spend another day on the couch and be back on Friday. I'm not about to let sick little kids get me down. What I WOULD like to do is whack their parents for letting them go to school coughing and sneezing, but then again, I'm sure babysitting is a problem. We're not talking the richest part of California here ... this is small town rural countryside where there's lot of scraping going on just to get by. Yup ..... still sick. I wish I could go back in time on the Time Travel Tractor and squish the little kid that gave me this yucky stuff. Just kidding of course!! I had good intentions of leaving really early yesterday and crashing on the couch, but it didn't happen. One tractor driver didn't show up. The roads were so bumpy, the trailers people ride in were banging so much they were getting a little scared. So the REAL tractor driver spent the morning fixing the roads while I drove. I tried to get a couple of quick pics of the scenery so you have an idea of what's here. 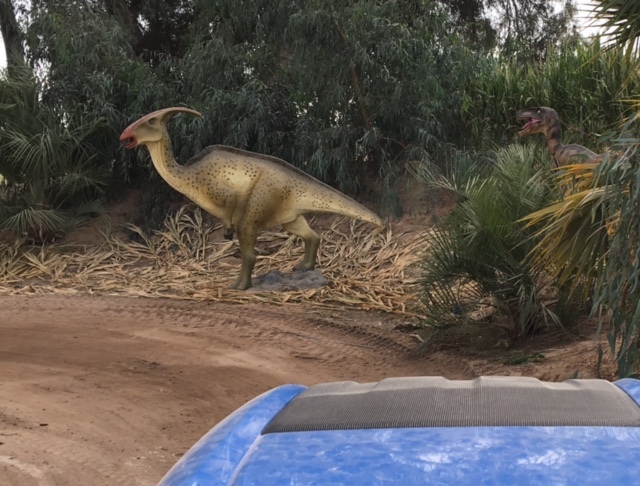 Although they look kind of small in the pictures, these are all life-size dinosaurs, 20-60 feet tall. I think there are about 25 or so, though I've never counted. From pterodactyls to T-Rex, they make the kids scream with delight. Ok, maybe a couple scream from fright. The saber-toothed tiger is one of the best!! So I gave my seed classes four times to small groups and drove tractor, before heading home and collapsing on the couch. With the deep chest cough coming on, I drank hot honey lemon water until my eyes were yellow and I attracted a hive of bees. I have another three small classes today, then I'm coming home BEFORE noon. It would probably help if I could get to town for some groceries and cough medicine, but that's not happening. I'm looking forward to an afternoon of sleep, glorious sleep!! I'm beginning to sound like a broken record. I made it to the Pumpkin Patch, thinking there was only 12 students. as I never moved from the couch. Although I'm not coughing so much, I'm still very tired. Three small classes this morning and I'll be back on the couch. Hope to have something more interesting to write about soon!!! they should really stay home, got to me. that makes me cough and sniff a LOT!! then I'm coming back home. I imagine I have several more to go!! So far none of my self-medicating is working. It Was BOUND To Happen!! Good Morning Kids ... welcome to .......... oh wait, I actually have a day off. It's a good thing, because (as I KNEW would happen) the little buggers have given me some kind of sickness that will probably be the death of me. Yesterday consisted of coughing fits, all of which originate in my chest. Unable to get in to a doctor, I'm self-medicating (not really, just benadryl and advil). Since it's viral, there's probably nothing they can do anyway. Hopefully it's a combination of dust and smoke from the last three days. It was BOUND to happen!! This was BOUND to happen too .. I'm surprised it took this long. I know you don't believe me when I say I can't cook, so here's the proof. Anyone care to guess what these once were? They were supposed to be little take-along snacks I could stash in the fridge at the pumpkin patch. I cooked these brussell sprouts just a tad bit too long. My oven needs fixing ... when I set it for 350, it barely reaches 250 according to the little temperature gauge inside. So I set them at 450. Unfortunately I got a little distracted making the bed and cleaning my bedroom. At the exact instant I remembered, the house alarms went off in every room. With sirens screaming, I grabbed the pan and raced outside, thankful they didn't burst into flames. Next, I turned on all the fans in the house. Luckily the sirens ceased in about a minute. I should have just stayed on the couch. As you can imagine, my house doesn't smell old any more, like when I'm gone. Now it has the sweet smell of burned cabbage. I turned on every candle device and plopped myself on the couch. It was going to be a LONG day!! Later in the afternoon, I kept looking at that box of rice krispies, trying to decide if I wanted to tempt fate. 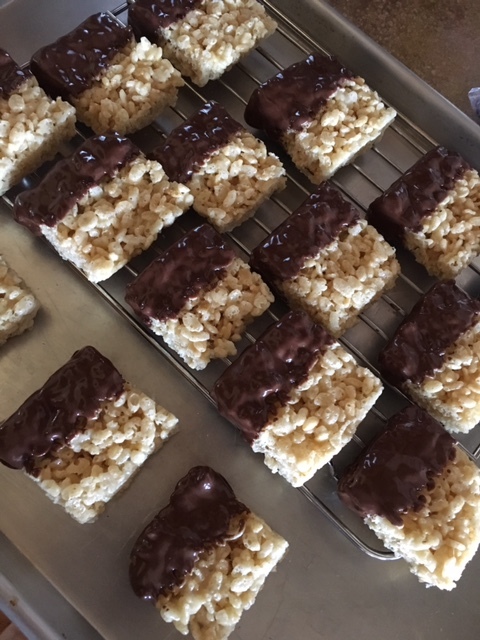 Well yes, I did ... so I whipped up a batch, then dipped them in chocolate for added calories. I can say they are very tasty, but really, I should have left the chocolate off. At least I didn't burn the marshmallows, so I feel a little vindicated. It's going to be another couch day, which isn't too bad since the Cubs are playing the Dodgers. Being a Giants fan you KNOW I'm rooting for the Cubs. So I'll be here .... napping in between coughing spasms. How exciting!! Hopefully if I DO have any seed planting classes tomorrow, they will be short and I can return home quickly. I sure don't want this crappy stuff to get the best of me!! Okay, I'll admit it. I'm REAL tired this morning. See the nice, calm, quiet, empty yard? It didn't last long at all. Three schools bussed in 600 kids at 8:30 am. It was a madhouse!! I caught two parents trying to sneak in without paying the required $5. They all like to come with their kids on the field trip and get in free, ride all the rides, then go home. For their $5, they get $5 worth of food or $5 off any pumpkin. Teachers are free ... parents, grandparents, aunts, uncles and those extra four kids have to pay. I even caught one lady trying to sneak around to the bathrooms to enter, saying she had already paid ... but she couldn't produce the required wrist band. After helping get all the classes going SOMEWHERE, three classes at a time went to the Learning Center. That meant three classes at a time ended up at Seed Planting. Honestly, I'm not sure why the schools schedule this for such a young class, but undaunted, I began my little spiel. In no time at all I discovered not a single student spoke English. Well THIS is going to be fun!! With lots of parent and teacher help, we finished in record time. NEXT!!! Another 50 kids came in and we did it again. In the end, when I asked for questions, there was one boy who kept looking at the two calves right behind our group. HOW DO THOSE COWS HAVE BABIES? The teachers rolled their eyes. I looked straight at him and said I didn't know. The cows were all taken care of by Farmer Scott. All I knew was how to plant seeds and grow corn. Thank you children ... the exit is to your left!! I never realized you have to think so quick around these little guys. For the most part, they have been very good at following directions, except for the "quiet please" part. I did have to get after a couple who wandered over to the gold mining section, NOT included in any school schedule. They started splashing water on each other and pretended to be deaf when I said to stop. Pretty soon, there were 25 kids with their hands in the dirty water looking for GOLD! "Sorry, this is just for looks ... there's no gold here" did not deter them one bit. It was a pretty crazy afternoon as all the kids left and the families began to come in for Movie Night. Hocus Pocus was being shown on the outdoor screen. In no time the snack bar went through twenty packages of hot dogs and a load of nachos. As the sun set, it was time for me to bug out. I'm looking forward to a full day on my couch with the puppies and my wonderful bottle of Advil!! With the smoke finally gone, it was a beautiful day at the Pumpkin Patch. The sunflowers they planted are blooming beautifully all around the yard. I get to spend quite a bit of time every day with the goats, getting lots of kisses. Last night they played King Of The Mountain as they butted each other off the top bale of hay. Honestly, I think this is the biggest "kid" attraction out here. I didn't notice these beauties until yesterday while driving the Dinosaur tractor. We only had two schools, which was a good thing. I have to give it up for the teacher ... when those kids got off the bus, she clapped her hands (never said a word), the kids clapped their hands, got in line, and were quiet as mice. Weird, right? Later when I saw them taking a picture, she put her hands on top of her head. Those ruffians snapped to, did the same, then all smiled for the picture. Trouble was, every other second, they went absolutely crazy, screaming and yelling and NOT following orders. Worst class I've ever seen. 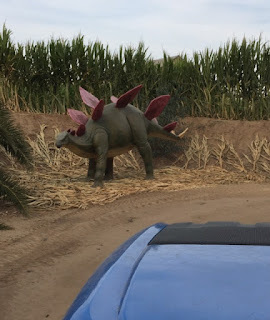 I chased some out of the corn field, found three sneaking into dinosaur land and returned two more that tried to get on the bounce pillow when everyone else was leaving. By the time they left, I was exhausted, so I contemplated these nice quiet bees on a beautiful sunflower. This is the same rowdy class of 50 I had to teach about planting seeds. Luckily I got them just after arrival. I clapped my hands like the teacher and they were quiet while I spoke. I also now enlist the adults to help pass out cups and write names. Makes my job SO much easier!! It was a late night as one of our local schools held a "family night", providing a catered dinner. I try really hard not to get special treatment in front of the working teenagers, but the Owner is always throwing me bags of Fritos or cookies. Last night, he brought me a full plate from the catered dinner, which I couldn't eat because I was driving the tractor. Not wanting to make the paying customers wait, I placed it on the transmission beneath my feet and drove while trying to stab the salad with a fork. Not exactly the best way to do it. The food was delicious!! Later, I saw the second catered group had roast beef!! RATS!! I got lasagne, but it was very good lasagne! Today is a biggie ... I've got 110 for seed class and over 500 kids will arrive by 10:00 am. I'm putting on my Patience Hat and zipping my mouth shut!! It's also Movie Night at the Patch. They are playing Hocus Pocus on the outdoor screen, so we'll be even MORE busy ... if that's possible!! Keeping my fingers crossed ... after all, it's Friday the 13th!! Bright and early, I was up and over at the Pumpkin Patch getting ready for the school kids to come in. Only 250 this particular morning. Scary, right?? We shipped half off to the Time Travel Tractor (dinosaurs) and the rest to the Magic Oven show. Farmer Scott spends about 20 minutes teaching kids before sending them over to me for Seed Planting 101. I'll try to get pictures, but I've been so swamped, I've barely had time to breathe!! Only four classes for me today, along with a MOMS group of littles. Maybe 3 out of 12 listened, so I figured we would feed the goats, as I've done with other classes. Much more fun!! Once done, they all hit the bounce pillow. This thing is HUGE and a kick in the pants!! Even the adults have a blast. It's actually held up by something akin to a leaf blower. You could easily hit the overhead shade cover if we let you!! I think the kids like it the best of all the attractions. I loaded kids on the Time Travel train, drove the Hay Wagon tractor and sold snow cones and pumpkins most of the day. By the way, every school kid gets a free pumpkin. That's how they roll. If your school can't bring you to the patch, they will take the patch to you with a truckload of pumpkins to hand out. The morning flew by. When lunch time came around, this was all I had time for. As much as I THOUGHT I was volunteering, I ran into two guys more stubborn than me. Their excuse? I was working too many hours (which they were highly appreciative of) and making them feel bad. I'm now on salary. I feel okay because it's not hourly, and they feel better because they are paying me. It's a win-win. It was a horribly windy, smoky day at the Patch. You couldn't see anything all morning from what the wind blew in all the way from Santa Rosa and Napa fires. Finally the smoke cleared enough for the evening visitors. I continued to drive tractor, but to be honest, every time I came around that corner, I was praying there was no one in line. Unfortunately, there was a group every time for another two hours. One last look at the barn as I finally headed home about 7:00. The puppies were happy to see me. Especially Miss Jessie who got sick all over the bathroom ... and I mean ALL OVER. I've no idea what caused it. I'm sure she didn't eat any of the same cookies "I" had!! So I'm off again today, looking forward to an early return home. I haven't gotten a single thing done around here and it's starting to show. Happy Fall everyone ... it's finally cooling down!! Long Hours Equal Happy Customers!! Can You Believe I Forgot?? ?